The Casa María Marianist Community celebrated the official beginning of the summer season with a Memorial Day barbecue hosted by the Holy Rosary Community, Monday, May 28. In the video, Brother Mark Motz, S.M., shares what is on the menu and why it was important for both communities — which are about 100 yards apart — to celebrate this holiday together. Congratulations to Brother Justin Quiroz, S.M., who professed his first vows in the Society of Mary, Province of the U.S., during Mass at Queen of Apostles Chapel at Mount Saint John in Dayton, Saturday, May 21, 2016. The Rev. Martin Solma, S.M., provincial superior, celebrated the Eucharist and received the vows while Brother Joe Kamis, S.M., assistant provincial, presented Justin with the Rule of Life. A reception and dinner followed at the Kennedy Union Center on the campus of the University of Dayton. Justin, a graduate of St. Mary’s University in 2013, was an aspirant with the Casa María community in 2013-14. Comments: Comments Off on ¡Viva Fiesta! About 40 Marianists from the San Antonio area gathered for the annual Super Bowl party at the Central Catholic High School Marianist Community on Sun., Feb. 7. Warm chili, drinks, fresh fruits and vegetables were served while a large rendition of game was projected on the wall in the school’s conference room. While a majority of the crowd left at halftime, most of the brothers of Casa María stayed well into the second half to witness the Saints win over the Colts 31-17. More photos on our Flickr set. Central Catholic High School salutes the New Orleans Saints and Tom Benson on their journey to the 2010 Super Bowl. This video features all Marianists on staff at the school, including several brothers of Casa María. 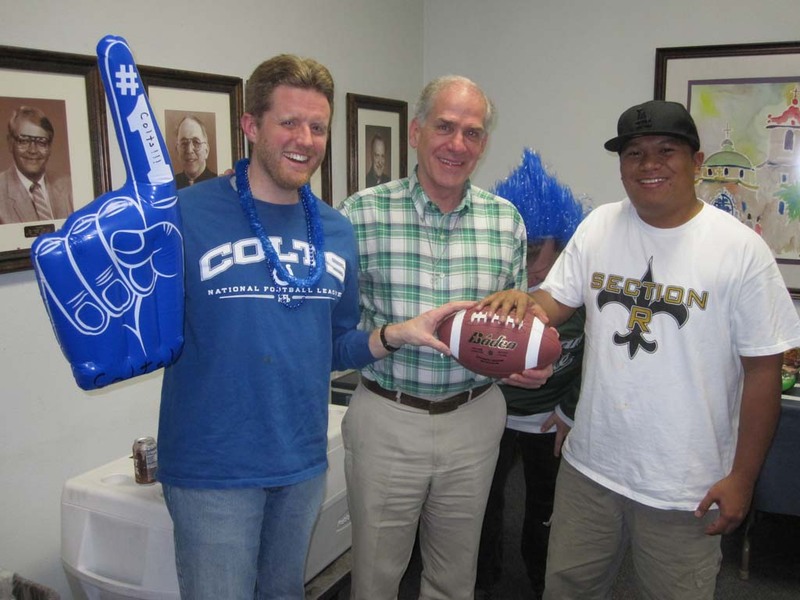 Tom, owner of the New Orleans Saints and a San Antonio businessman, is a longtime Central Catholic supporter. Last September, thanks to a $4 million gift by Tom and Gayle Benson and Family, the school renamed its stadium to honor the memory of his son.